As a far younger man back in 1992 I commenced working in Cellar Door sales in Australia's Hunter Valley. Since that initial taste I was hooked on wine as my career choice. My passion for the industry led me to complete my qualification in Wine Marketing at the University of Adelaide’s Roseworthy Campus. After gaining experience across production, sales and marketing I progressed my career to senior management level within several NZ wineries. Feeling the entrepreneurial pull and with New Zealand’s 1st defence of the Americas Cup looming I founded the country's first N.Z. Wine Makers' Centre in downtown Auckland. Over a 6-year period my team and I developed a successful business with a significant portion of sales being exported directly to international consumers. After divesting the sales side of the business in 2006 I rebranded the export side as "nzwinehome". Since our inception back in 2006 we have proudly pioneered the development of the Direct to International Consumer Sales Channel. At our heart we believe that NZ Wine Producers should 100% of their relationship, directly with their Customers. Everything we do is directed towards supporting our Producer Partners maximise their direct to International Consumer wine sales. My team and I are always keen to share ideas on ways that we can support you, so please don’t hesitate to contact us. After leaving the bright city lights of Auckland in 2011, my husband and I along with our three boys found ourselves settling in the beautiful Bay of Plenty. I come from a history of administration, customer service and sales based roles and joined the nzwinehome team in April 2015. I have a passion for great Customer Service, so I love the fact that I can support our NZ producers to reach their international customers and develop a long standing relationship off the back of a great experience. I also have a huge amount of love for wine so I take great pleasure in seeing our world class New Zealand wines delivered to the rest of the world. Favourite Wines: (I can’t choose just one!) In the summer time I love a cold Rosé or Chardonnay and in the winter months a Pinot Noir or Cabernet Sauvignon with my husband. After spending many years working abroad in the investment banking and finance industries throughout the UK, Dubai and finally Sydney, I now call NZ home with my husband and two step-sons. Whilst traveling I was able to satisfy my passion for wine by immersing myself in the respective countries wines so I feel qualified to say NZ has the best by far! Having seen the wine of choice at many large conferences and events overseas, it’s clear that the rest of the world agrees with me. I have a particular interest in finding and sampling some of the lesser known wineries wherever I travel as I find they often have a lot of passion behind them and I enjoy being able to find out how their product has developed. In my free time I enjoy travelling, music, our lovely beaches and dining out. However, there’s nothing I treasure more than the regular Sunday afternoon catch up with my family where we talk about the week and usually sample a bottle or two! I am fortunate to join the hardworking nzwinehome team part time following six months’ vacation. I have a solid background in Communications and Marketing, predominantly in manufacturing, events and tourism, more recently I changed hats and delved into compliance for an investment firm. In my spare time I enjoy exploring both locally and abroad. Proud of New Zealand wines achievement on the world stage, I always get a kick when I see a kiwi wine listed overseas. I adore a cool Rose on a summer afternoon with friends or savouring an earthy Syrah over dinner. This is our superstar Export Support Warehouse crew. Neil, Stephen, Graham and Greg. The backbone of nzwinehome! We would be lost without these guys. They've been tasked with the very important job of meticulously hand checking every single bottle of wine that arrives at our Export warehouse and then carefully hand packing them all. They're the final set of eyes and hands on your precious wines, ensuring the highest level of presentation for when your customer opens up their box. 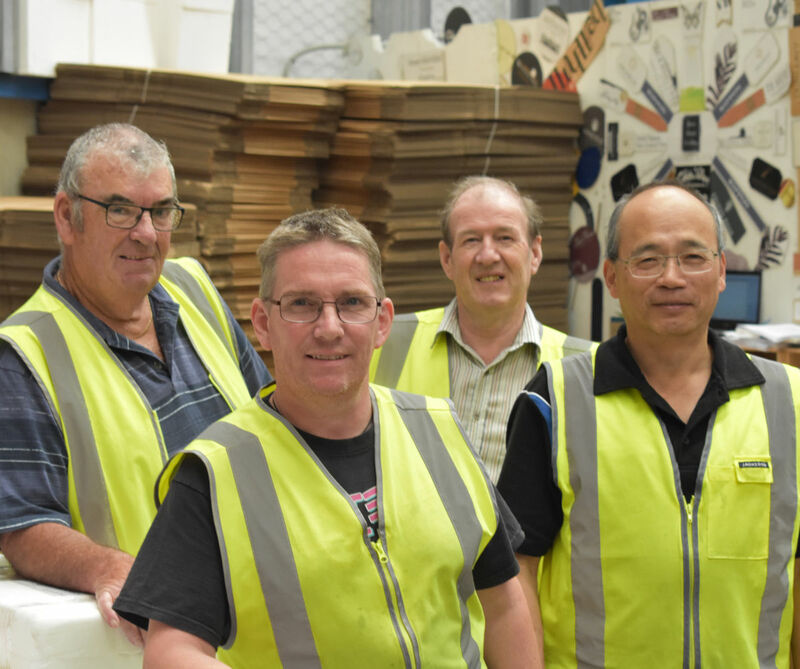 Our experience in the area of direct to international consumer deliveries dates back to 1992 when our founder first commenced in the Wine Industry. Some 20+ years later we are highly regarded by many as a leader of the N.Z. Direct to International Consumer sales channel. We're immensely proud to be chosen as the preferred provider for many of New Zealand’s iconic wineries and respected wine retailers. Our core business is working in partnership supporting wineries and wine retailers to enable them to maximise their direct-to-international consumer sales opportunities. Originally much of our business was generated via wine tourism activities. These days tourism still plays a part however e-commerce is growing rapidly. Many of our winery customers achieve significant volumes of repeat sales with their international consumers via website and email-database communication. Our team holds vast expertise and experience in export, logistics and wine sales. As wine people it’s in our blood to care about your wine and your relationship with your customer. For more information please don't hesitate to contact us. Or, contact any of customers for their independent opinion of our business and services.